Enriched by our vast industrial experience in this business, we are involved in offering an enormous quality range of Mechanical Seal Ring. 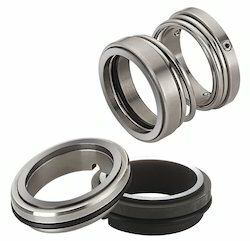 These products are extensively used as an integral part of mechanical seals in varied industries. Scope of supply: We offer a very wide range of mechanical seals like PTFE Bellow seals, Rubber Bellow Seals, Metallic Bellow Seals, Single spring, Conical spring and Multispring seals suitable for varied applications. Our in-depth knowledge and industrial expertise enable us to manufacture, trade and supply a distinguished range of Mechanical Seals. Keeping the diverse requirements of customers in mind, we are instrumental in providing Metal Bonded Seal Ring. Seal rings are used in our Hot Runner Nozzles in various sizes as per the nozzle requirement.